After 680 games since September 21, the 2017-18 Ontario Hockey League regular season schedule is complete. All 16 playoff positions have been claimed with all final rankings and first round playoff matchups confirmed. In the Eastern Conference, the first place Hamilton Bulldogs will play the eighth place Ottawa 67’s, the second place Barrie Colts will face the seventh place Mississauga Steelheads, the third place Kingston Frontenacs will host the sixth place North Bay Battalion, and the fourth place Niagara IceDogs will take on the fifth place Oshawa Generals. Western Conference matchups include the first place Sault Ste. 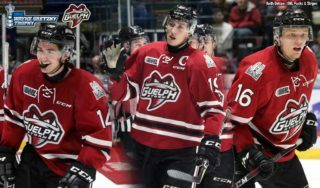 Marie Greyhounds against the eighth place Saginaw Spirit, the second place Kitchener Rangers face the seventh place Guelph Storm, the third place Sarnia Sting meet the sixth place Windsor Spitfires, and the fourth place Owen Sound Attack have home ice against the fifth place London Knights. Game 1, Thurs., March 22 at Hamilton – 7:00p.m. 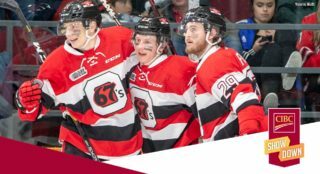 Game 2, Sun., March 25 at Hamilton – 7:30 p.m.
Game 3, Tues., March 27 at Ottawa – 7:00 p.m.
Game 4, Wed., March 28 at Ottawa – 7:00 p.m.
Game 5, Fri., March 30 at Hamilton – 7:00 p.m.
Game 6, Sun., April 1 at Ottawa – 2:00 p.m.
Game 7, Tues., April 3 at Hamilton – 7:00 p.m.
Game 1, Thurs., March 22 at Barrie – 7:30 p.m.
Game 2, Mon., March 26 at Barrie – 7:30 p.m.
Game 3, Tues., March 27 at Mississauga – 7:00 p.m.
Game 4, Thurs., March 29 at Mississauga – 7:00 p.m.
Game 5, Sat., March 31 at Barrie – 7:30 p.m.
Game 6, Sun., April 1 at Mississauga – 2:00 p.m.
Game 7, Tues., April 3 at Barrie – 7:30 p.m.
Game 1, Fri., March 23 at Kingston – 7:00 p.m.
Game 2, Sun., March 25 at Kingston – 6:00 p.m.
Game 3, Tues., March 27 at North Bay (in Sudbury) – 7:00 p.m.
Game 4, Thurs., March 29 at North Bay – 7:00 p.m.
Game 5, Sat., March 31 at Kingston – 7:00 p.m.
Game 6, Sun., April 1 at North Bay – 7:00 p.m.
Game 7, Tues., April 3 at Kingston – 7:00 p.m.
Game 1, Fri., March 23 at Niagara – 7:00 p.m.
Game 2, Sun., March 25 at Niagara – 2:00 p.m.
Game 3, Tues., March 27 at Oshawa – 7:05 p.m.
Game 4, Thurs., March 29 at Oshawa – 7:05 p.m.
Game 5, Sat., March 31 at Niagara – 7:00 p.m.
Game 6, Sun., April 1 at Oshawa – 6:05 p.m.
Game 7, Tues., April 3 at Niagara – 7:00 p.m. Which 2018 #OHLPlayoffs First Round Eastern Conference matchup will be most exciting? Game 1, Fri., March 23 at Sault Ste. 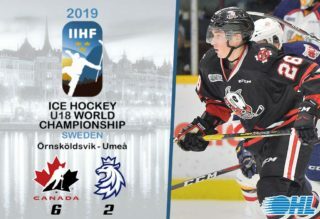 Marie – 7:07 p.m.
Game 2, Sun., March 25 at Sault Ste. 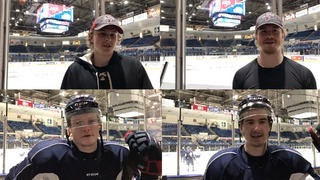 Marie – 3:00 p.m.
Game 3, Mon., March 26 at Saginaw – 7:05 p.m.
Game 4, Wed., March 28 at Saginaw – 7:05 p.m.
Game 5, Fri., March 30 at Sault Ste. 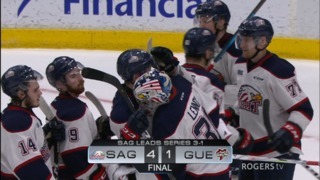 Marie – 7:07 p.m.
Game 6, Sat., March 31 at Saginaw – 7:05 p.m.
Game 7, Mon., April 2 at Sault Ste. 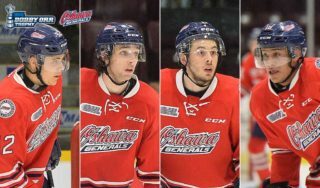 Marie – 7:07 p.m.
Game 5, Fri., March 30 at Kitchener – 7:30 p.m.
Game 6, Sun., April 1 at Guelph – 2:00 p.m.
Game 7, Tues., April 3 at Kitchener – 7:00 p.m.
Game 1, Fri., March 23 at Sarnia – 7:05 p.m.
Game 2, Sat., March 24 at Sarnia – 7:05 p.m.
Game 3, Tues., March 27 at Windsor – 7:05 p.m.
Game 4, Thurs., March 29 at Windsor – 7:05 p.m.
Game 5, Fri., March 30 at Sarnia – 7:05 p.m.
Game 6, Sun., April 1 at Windsor – 2:05 p.m.
Game 7, Tues., April 3 at Sarnia – 7:05 p.m.
Game 1, Thurs., March 22 at Owen Sound – 7:00 p.m.
Game 2, Sat., March 24 at Owen Sound – 7:30 p.m.
Game 3, Mon., March 26 at London – 7:00 p.m.
Game 4, Thurs., March 29 at London – 7:00 p.m.
Game 5, Sat., March 31 at Owen Sound – 7:30 p.m.
Game 6, Mon., April 2 at London – 7:00 p.m.
Game 7, Tues., April 3 at Owen Sound – 7:00 p.m. Which 2018 #OHLPlayoffs First Round Western Conference matchup will be most exciting?